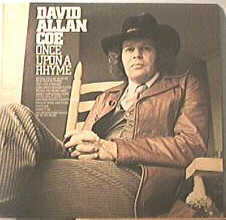 Once Upon a Rhyme is the fourth studio album by American country singer David Allan Coe. 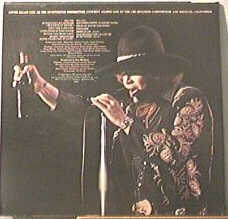 It was released in 1975 on Columbia. In 1973, Tanya Tucker went to the top of the country charts with David Allan Coe’s “Would You Lay With Me (In a Field of Stone),” turning a lot of singers and Nash Vegas executives’ heads in his direction. Coe opens 1975’s Once Upon a Rhyme with his own version of the song — a gutsy thing to do for anybody, but then, Coe was always equal parts talent and raw nerve. The amazing thing is that both versions are definitive. But that first track is only the beginning of a truly wondrous journey through the mysterious and poetic sound world of David Allan Coe as both a singer and a songwriter. Produced by Ron Bledsoe and accompanied by some of Music City’s finest new-generation session players — like Charlie McCoy, Buddy Spicher, Reggie Young, and Pete Drake — Coe follows his opener with another of his inimitable classics, “Jody Like a Melody,” with its winding, lilting choruses and ethereal couplets. After the emotional impact of the first two tracks, add two self-penned masterpieces — “Loneliness in Ruby’s Eyes” and “Would You Be My Lady” — and the listener is left nearly breathless. But with Coe, that’s not enough, and he digs deeper emotionally with “Sweet Vibrations” and “Another Pretty Country Song.” And brilliantly but inexplicably, he closes the set with three songs that either were, or became part of, the country canon as a result of this recording: Lawton Williams’ “Fraulein,” Richard Dobson’s “Piece of Wood and Steel,” and Steve Goodman’s “You Never Even Called Me by My Name.” The last of these is the only version most people know; it was as if the late Goodman had written it for Coe. His voice wraps itself so completely around the melody that the lyrics run like a river from his mouth, and he becomes the song’s protagonist, supported in the weight of his grief by an electric guitar, a fiddle, and a pedal steel slipping in and out of an airy mix that is punctuated by a rhythm section that only underlines the truth in every line. This album and its predecessor, The Mysterious Rhinestone Cowboy, established Coe as a major songwriting force; they remain enduring testaments to his songwriting brilliance as a criminally under-examined talent in the country tradition.